The earliest record of winemaking in Maryland is in 1648, less than twenty years later the Governor of the time plants 200 plus acres of grapes. Currently, there are seventy licensed wineries, the oldest existing 70 years old. Today there are seventy plus wineries licensed in Maryland that produce annual sales of around $26 million as of 2013. With Maryland wine being sold at 300 plus restaurants and 800 plus retailers the market is expanding and has increased every year since 2000 except for one. In fact, in the ten years from 2001 to 2011 the wine sales in Maryland tripled. Over the past 350 years the wine industry in Maryland has come a long way. The 1600’s and 1700’s had minimal amounts of grape growing, less yet winemaking. Big steps came in the 1800’s when John Adlum wrote a book, the very first book in fact, on viticulture and winemaking in America and the Maryland Society for Promoting the Culture of the Vine was formed. The first half of the twentieth century made way for the first bonded winery in Maryland, Boordy Vineyards, and it still exists today! During the 1970’s 5 new wineries arise, and then in 1981, the Maryland Grape Growers Association is formed. The 1980’s were a booming decade for wine growing in the state, as well as the establishment of many new wineries and vineyards. The movement also began to form AVAs, which stands for American Viticultural Area. In 1984 Maryland had their very first Maryland Wine Festival and the Maryland Winery and Grape Growers Advisory Board were formed. By the year 2000 the Maryland House Bill 414 was passed. The bill stated that wineries were allowed to sell wine by the glass at the winery — alongside this, there was record-breaking attendance at the Maryland Wine Fest and the wineries sold a record of over 85 thousand gallons of wine. That number has quadrupled as of 2013! Maryland is divided into five regions because of the distinctive geographical differences: the Appalachian Mountains, the Piedmont Plateau, and the Atlantic Coastal Plain. The average temperature in the state is 56 degrees, and thanks to the Chesapeake Bay the extremes of summer and winter are held off. The growing season is approximately 195 days long, which is more than enough for most varietals. The majority of rainfall occurs in spring and late fall, meaning that the dryer summers increase sugar levels in the crop. This makes the state well-suited for high-quality grapes. This region includes the entire Eastern Shore and part of the Western Shore. The Eastern Shore has little to no elevation, but the western shore rises to about 400 feet. This makes up for approximately half of the state and is made up partially of lowland and marshes as well as rivers and streams. This also incorporates the Chesapeake Bay which along with the flat land and mid-range temperatures makes for excellent farmland. Soils in this region are highly varied, from silty soils to dense subsoil. The silty soil is going to be much preferable for growing grapes. Lying west of the Coastal Plain is the Piedmont Plateau. The elevation here is much different and ranges from 800 to 1200 feet. The topography in this region is comprised of gently rolling hills. The soil in this region is also varied depending on the rock formations and the weathering. There is ‘saprolite’ otherwise known as rotten rock, ‘channers’ which is gravel sized, and then iron-bearing soils characterized by red color due to the clay. Clay soils can offer a healthy environment for grape growth. The following three regions all have similar soils formed from sedimentary rocks including sandstone, limestone, and shale. The limestone is generally found in the valleys, the sandstone and shale are found on the higher terrain. Limestone-rich soils mean calcium-rich soils – these are excellent for growth due to the water-retention capabilities, low-pH nutrient-rich, deep root system, and disease resistance. The main characteristics of this region are the two mountains in it: Catoctin Mountain and South Mountain. It cuts across the state north to south. This is the narrowest region of the state, and is made up of the Cumberland Valley. This is part of the Allegheny Mountains and covers the westernmost part of the state, and is where Backbone Mountain is located. Maryland has four distinctive regions for growing grapes. This allows for a wide variety of grapes to be grown throughout the state. Maryland Wine Trails are an excellent way to begin the process of purchasing a winery for sale in Maryland. The Maryland wine trails are all self-guided, so take all the time you need to at each and every winery to get a feel for what they have to offer. 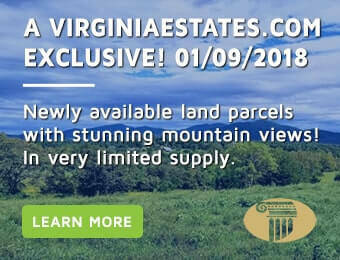 Virginia Estates is the premier real estate agency in vineyard and winery sales in Maryland, Virginia, and North Carolina. Their professionalism ensures discrete and confidential representation in the listing and sale of the finest vineyards and wineries that have a wide range of price and production. For more information, call us at 877-646-8800 for immediate personal service.